Become an independent contractor. Work from home or while you travel. Run your business with no doors and no overhead. Increase your access to trainees and watch your online business grow! Let us do the marketing and advertising to bring in new business. Instant Supervisor has partnered with colleges all over the world to provide online supervision to their graduate students. This leaves you with time to focus on doing the fun part; teaching and mentoring your trainees. Intuitive scheduling software & automated monthly payments! Manage and teach your trainees through our state-of-the-art platform. Our scheduling software and automatic monthly payments directly to your bank account allow you to minimize administrative time. Work from anywhere, anytime, as long as you have a mobile device or stable internet connection. World-class HD video conferencing software and expert knowledge! Our platform is designed with clinical guidance from distinguished leaders in the field of Applied Behavior Analysis. Take advantage of full access to the #1 rated online meeting software with HD video conferencing. Participate in community discussions with other successful remote BCBAs - you may even make a friend or two! Thank you. We look forward to contacting you soon! 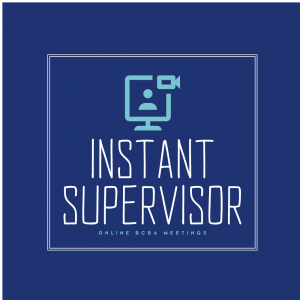 Whether you’re looking for a new stream of revenue, seeking flexibility in where and when you work, or are interested in reaching trainees for which supervision was not previously accessible, Instant Supervisor is the leading online supervision platform for BCBAs. Read our Code of Ethics to learn more about the values held by Instant Supervisor and our BCBAs.